Description of images painted, drawn or illustrated. Geese Mate for Life ! \ Geese Pairs Heading South (Illustrated 2013) Crow Quill pen with India Ink on Crescent Illustration board 7.5″x10″. 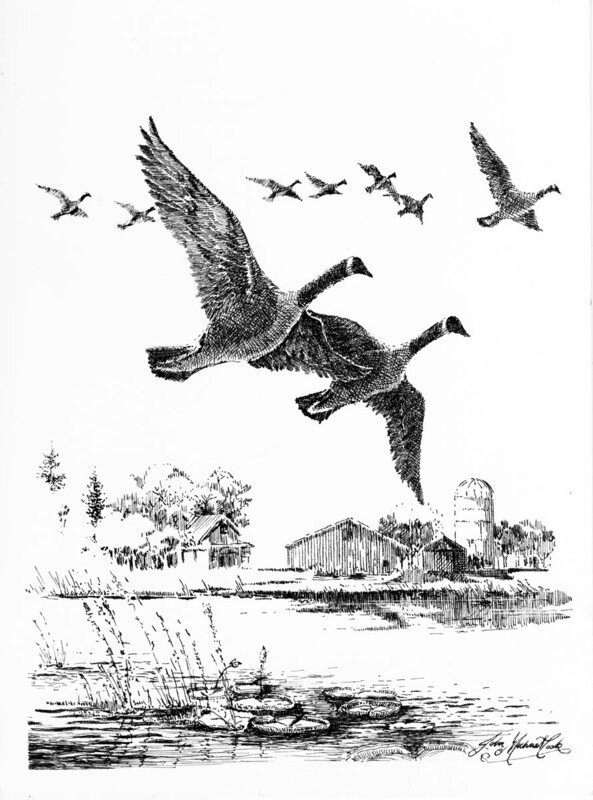 After living in Minnesota for many years, the geese in flight and their honking arrivals and departures, have become a familiar bird watching experience. It is always exciting to watch and also to illustrate. Geese are a messy bird and some would say a bother. True, if they are on your front lawn, but in the air they are magnificent. This bird mates for life and flock as a group for life as well. Wildlife painting requires good research information and observation, sometimes seeing the geese fly gives enough inspiration to go do the research or get the camera, or sketch pad out. Bird watching is not only a great and popular hobby, it is a great wildlife painter pleasure too! This entry was posted in Pen and Ink and tagged Bird-Birds, ink, pen, Wildlife on February 28, 2013 by eightdecades.